Can I let you in on a little secret? I don’t really care for french fries. (Gasp!) I know, I know. How un-American. I’ll eat them sometimes if they are really good, but I find that most of the time they just aren’t great, so I’d much rather have a baked potato. Or sweet potato fries. Now sweet potato fries I can get down with. However, I know they still aren’t very good for you. Kind of like how a plain potato is good for you before you deep fry it and drench it in salt. So I usually just steal a couple of my hubby’s when he’s not looking and call it good. But I do still really love crispy sweet potatoes to accompany my burger or chicken. So what’s a girl to do? 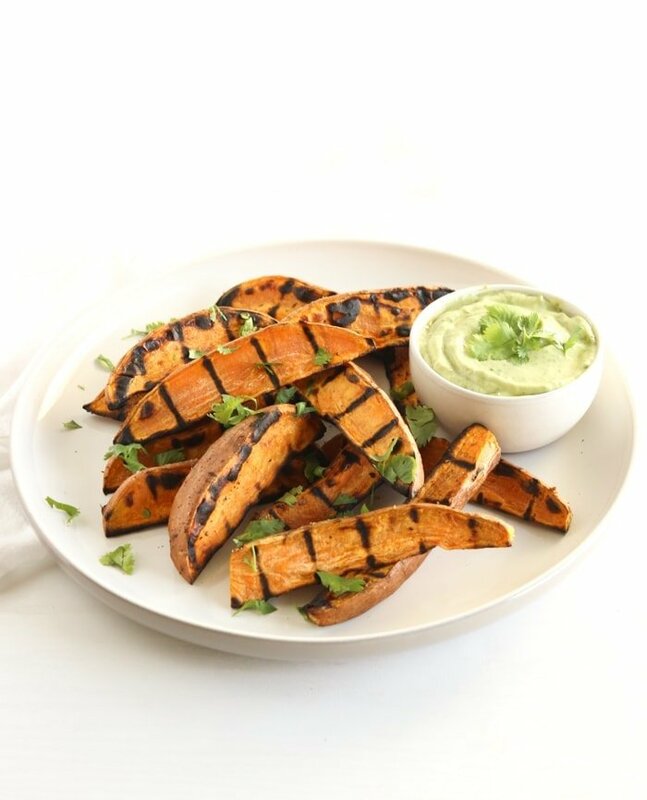 NOT get out the peanut oil and heavy-bottomed skillet (way too messy), but make these Grilled Sweet Potato Wedges with Avocado Cream Sauce instead! 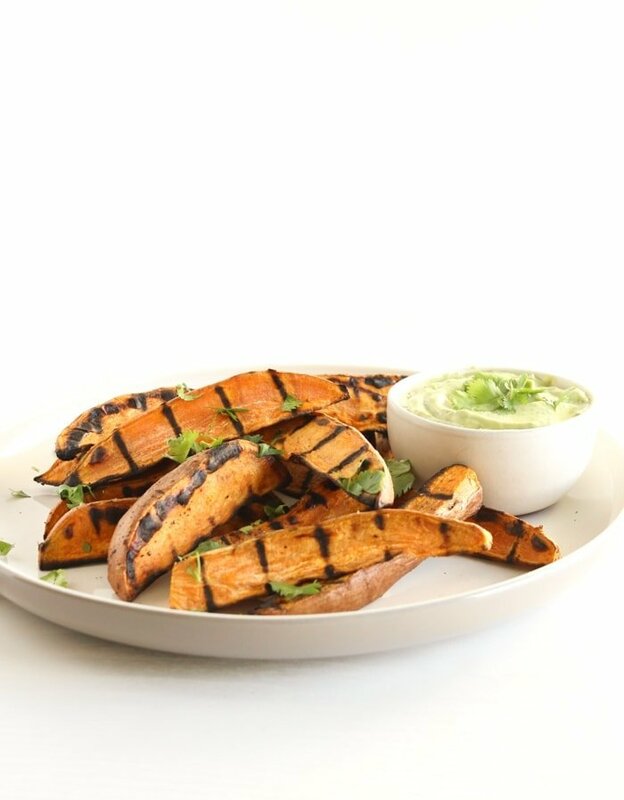 They’re the perfect side dish to go with all of your grilled favorites when you’re craving a crispy sweet potato fry. BUT these are way healthier for you! They are tossed in just a half teaspoon of heart healthy olive oil, and grilled for some serious flavor and crispiness. And those beautiful grill marks, because if it doesn’t have marks, did you really even grill?
) 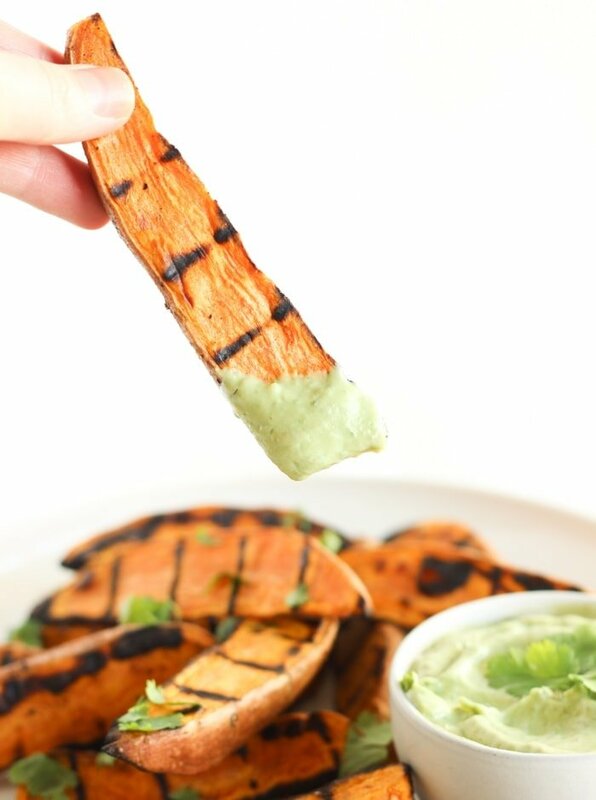 and you’re ready to dip as soon as those grilled sweet potato wedges come off the grates! Ketchup who? 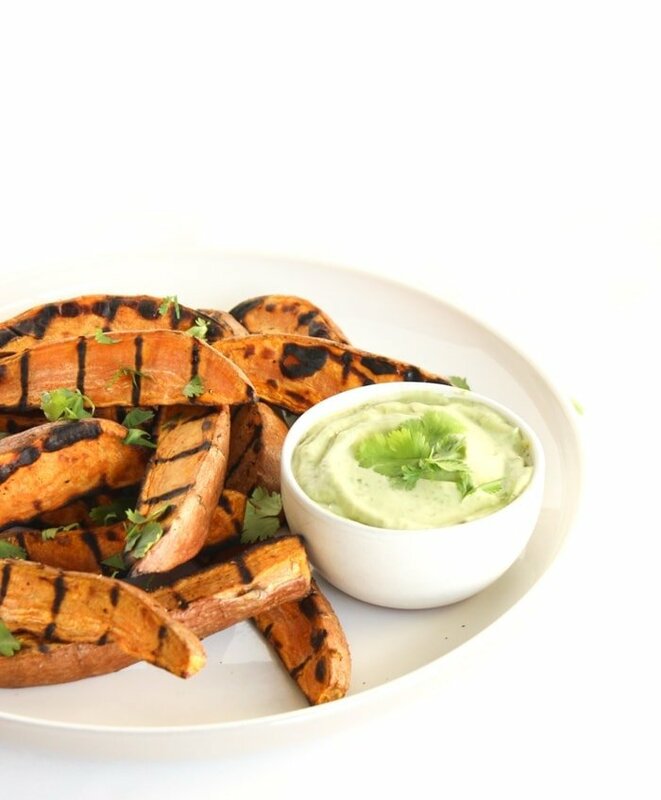 Since it’s summer and I know you’re going to be grilling approximately 99.9% of weekends for the next couple of months, do yourself a favor and try grilling your sweet potatoes next time. You can thank me later. 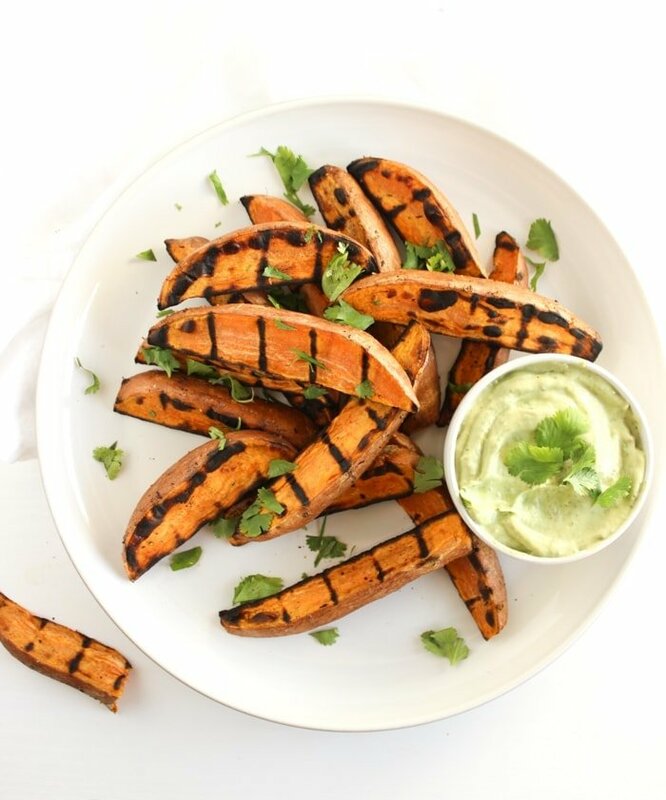 Wash and cut each sweet potato length-wise into 8 wedges. Place in a microwave-safe dish and cover with water. Microwave 5-6 minutes, or until soft but not mushy. Drain. Toss potato wedges with oil, paprika, and salt and pepper to taste. Grill wedges for for 5 minutes on each side. Serve with Avocado Cream Sauce. Blend all ingredients in a food processor or blender until smooth. Refrigerate until ready to serve. I’m with you on fries. Unless they’re super crispy I can skip ’em. 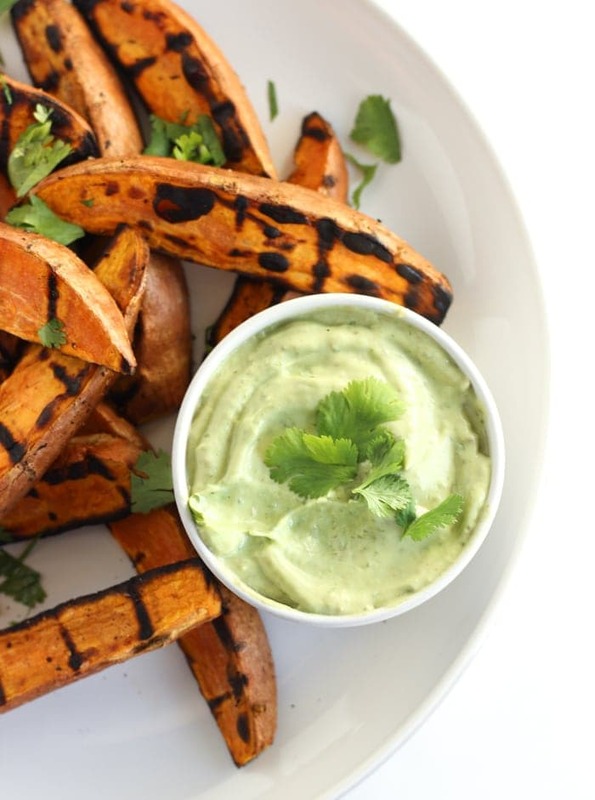 Love me some sweet potato fries – well done of course! And these look pretty darn good, especially dipped in that avocado cream! Yum! 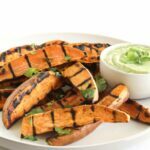 Sweet potatoes are my new best friends – I am serious! I am totally obsessed lol! What do you mean by ‘cover with water’? Place the wedges in water? Or place a bowl of water above the wedges? You place the wedges in water to cook.